The Sorrento and Amalfi Coast is an enchanting combination of beauty and gripping drama with its coastal mountains plunge into the sea in a stunning vertical scene of precipitous rocks, pictoresque and colorful town and lush forest. A beautiful place to celebrate your dreaming wedding day! Amalfi is the main town of the Amalfi coast and it is a small town surrounded by dramatic cliffs and a beautiful coastal scenery. It was once the capital of the Maritime Republic of Amalfi even if today the maritime activity is limited to yachts and cruising boats and of course Amalfi offer a very good ferry service operates between the larger coastal towns. The rich green vegetation and the bright yellow of fruits in the vast lemon orchards melts up with Arabian-shaped small white houses show up against the clearest sky and the deep blue of the sea! 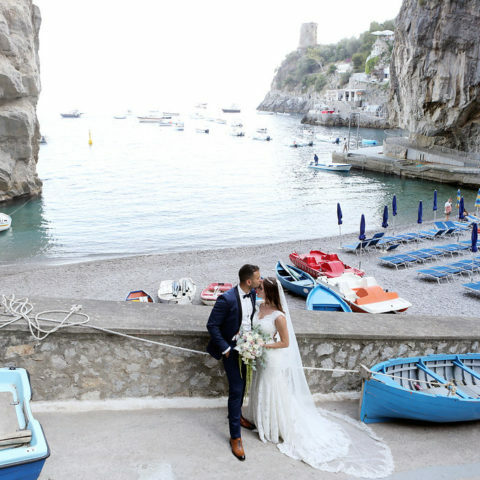 Generally, couple select Amalfi for their destination wedding as it offers different beautiful venues overlooking the sea side; in fact it is possible to find many refined and traditional venues for your Amalfi Coast wedding offer a waterfront view. The Civil ceremony can be planned at the Arsenals, an historical place where they use to build the boats and it has been well preserved since the Medieval times. The catholic wedding can take place at the magnificent Duomo of St. Andrew located in the main square. In Amalfi there is a church for the Protestant ceremony too. For the symbolic ceremony, you’ll be spoiled by the many options offered. The town of Amalfi is indeed a spectacular location for destination weddings at any time of year. Visit the fascinating paper museum. Go for a swim at the Fjord in Furore. Plan the trekking at La Valle delle Ferriere. It is one of the most beautiful path of the area and it cannot be missed. The Island of Capri has two Municipality on the island: Capri and Anacapri. Capri has a small square in the centre the Piazzetta, while Anacapri is at a higher elevation on the slopes of Mount Solaro. Marina Grande is where the port is located. With its whitewashed stone buildings and tiny, car-free streets, Capri Town feels more like a film set than a real life one. A diminutive model of upmarket Mediterranean chic, it’s a pristine mix of luxury hotels, expensive bars, fancy restaurants and designer boutiques. Having a coffee or a drink in “the Piazzetta” and “Taverna Anema e Core” is something you should do once in life. Walk on Via Tragara, considered the most romantic street of the island. Take a stroll through the lush vegetation and sweet smelling flowers that leads up to Augustus Garden surrounded by spectacular views of the famous Faraglioni rocks. Discover the Axel Munthe’s Villa San Michele in Anacapri. Have an aperitif to enjoy the sunset at The Punta Carena Light House. Take the chair lift to Monte Solaro. Don’t miss the Via Krupp that leads down to the sea. Positano is the coast’s most picturesque and photographic town, with steeply stacked houses tumbling down to the sea in a cascade of sun-bleached peach, pink and terracotta colors. No less colourful than its steep streets and steps lined with wisteria-draped hotels, smart restaurants and fashionable boutiques. 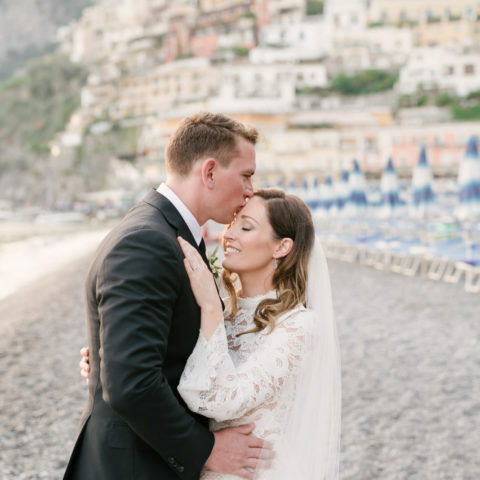 Positano offer nice venues overlooking the pyramid of the town and beautiful beaches for a beach wedding at is considered the most famous town along the coast for a Positano wedding. The town itself is characterized by the many steps to move around. It is a Slow City – just relax it! Praiano is an ancient fishing village, a low-key summer resort but an increasingly popular centre for the arts. With no village centre as such, its whitewashed houses scattered around the verdant ridge of Monte Sant’Angelo as it slopes towards Capo Sottile. Beautiful characteristic beaches and venues are available. Swim at the Marina di Praia, the last fishing village in the area. Eat the “red totani” which is the local squid. Visit the astonishing Emerald Grotto. 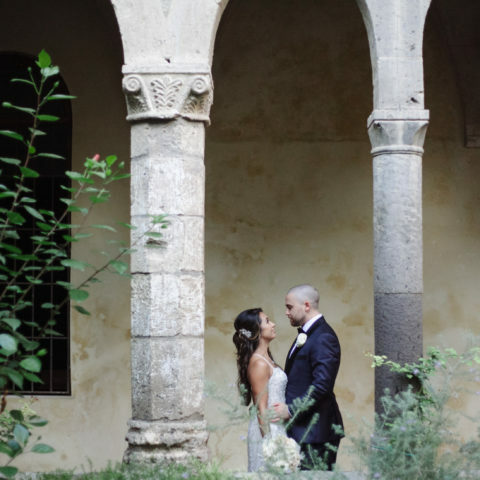 Consider to plan your wedding in Ravello, means to the most magical day of your life! 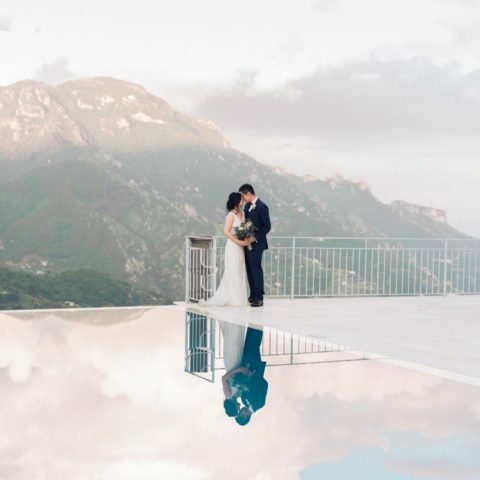 Perched high above the Amalfi coast, Ravello is considered a little piece of heaven, the perfect location for romantic destination weddings with its infinite and breathtaking views. It is a refined, polished town almost entirely dedicated to tourism and increasingly popular as a wedding venue. Boasting impeccable bohemian credentials – Wagner, DH Lawrence and Virginia Woolf all spent time here – it’s today known for its ravishing gardens, fascinating villas and stupendous views, the best in the world according to a former resident Gore Vidal, and certainly the best on the coast. 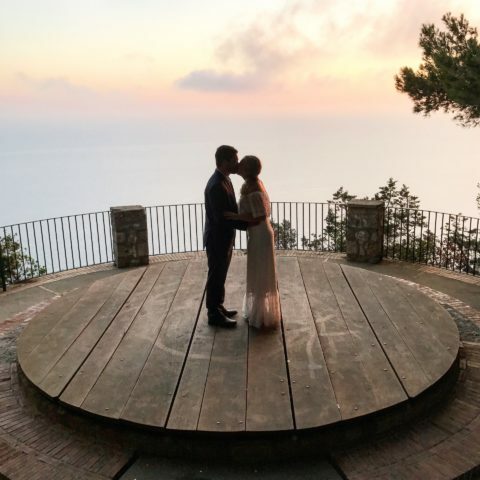 for a Ravello wedding you can choose between many venues, all with breath – taking view! A beautiful garden is offered for the celebration of a civil wedding in Ravello. Ravello wedding is the a luxury and top destination in Italy. 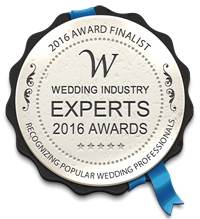 as result for your Amalfi coast wedding you should start planning in advanced to ensure the best venue for your perfect day. Contact here to schedule a consultation with me! Infinity view, almost from every corner over the sea! Villa Rufolo – a beautiful public villa where it is organise the Music Festival over the summer time. Incredible experince to live for you and your guests. Sorrento is for sure the biggest and the most famous town of the all Sorrento & Amalfi Coast. Perched on the cliff overlooking the sea, Sorrento lies on the Gulf of Naples and it is a lively town almost all year around. Sorrento makes a good base for exploring the surrounding area: to the south, the best of the peninsula’s unspoiled countryside and, to the east, the Amalfi Coast; to the north, Pompeii and the archaeological sites; offshore, the fabulous Capri. 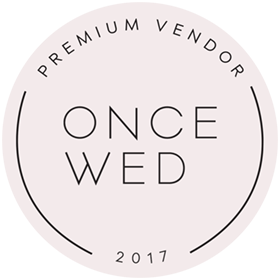 Sorrento is very popular location for a destination wedding and it is very popular to tie the know in this town from April to October . Due that, I do recommend to consider a Christmas wedding, the time in which the town is a triumph of lights that will make the wedding day even more special. Many options for a wedding in Sorrento. From hotel to private villas, all the venues offer a beautiful terraces overlooking the bay of Naples and the Vesuvius. Having an aperitivo at the sunset to enjoy the incredible view over the Gulf of Naples with beautiful colors. Easy access with the public transport from Naples airport . Ferry to Capri and to the Amalfi coast runs daily.